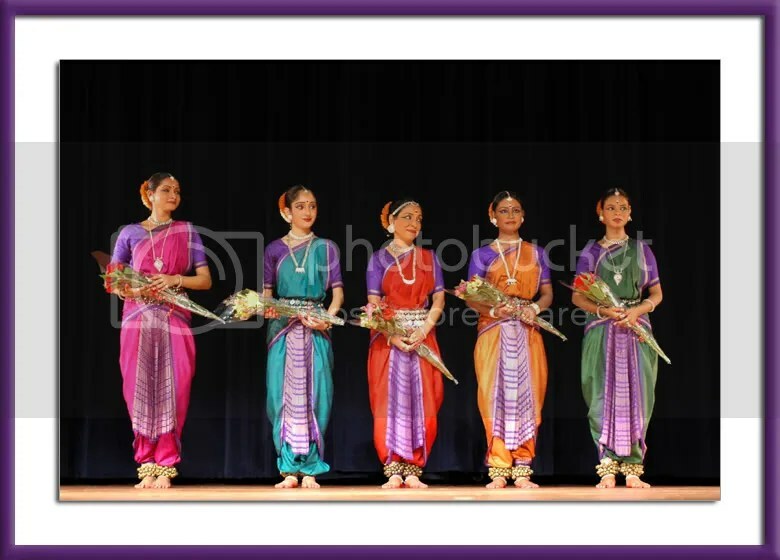 After a glowing recommendation, we attended this dance performance by Padmashri Madhavi Mudgal and the Gandharva Dance Ensemble on Saturday. It was such a stunning performance. The dancers were graceful in their movements and made it seem so ridiculously simple. Certainly, grace comes from decades of practise. Their movements were well coordinated and also had the force of conviction. No hesitations here, by her younger colleagues either. The costumes were exquisite and perfectly matched. 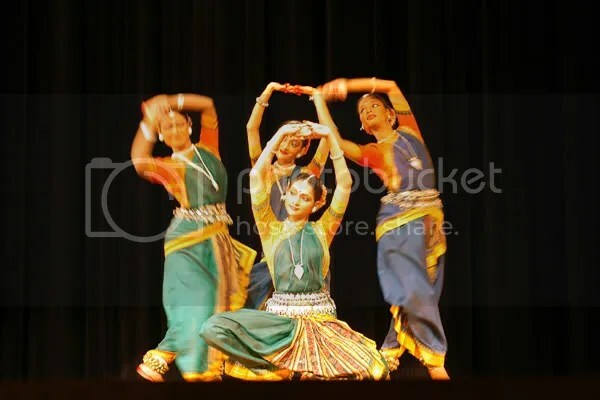 In the pic above, Madhavi and her niece Arushi Mudgal performed this nritta piece called &apos;Dvidha;&apos; more like a friendly jugalbandhi between dancers. Simply superb! I was fortunate they stopped for a split second as my shutter opened 🙂 And, I had the best seat. In row 2, at center stage! Since the seats were staggered, we had unobstructed views. And more amazingly, my eyes were level with the floor of the stage. They performed 6 pieces, and as they announced the last dance, I was saddened: what? this is the end? I could have watched them perform all night. The lighting and music were very well done, thanks to their lighting specialist who accompanied them from Delhi! The organizers arranged a nice dinner and reception and we got a pic with Madhavi Mudgal as well. I spoke to some of the dancers, and they have been in training for 16 years! No doubt, they make it look so easy. Check the link above, they have a performance in Flushing NY (Sept 16) and in Houston, TX (Sept 17). What worked: I did not want to use the flash and distract the dancers. So I selected the 50mm/1.8 lens with the D70. The widest aperture in my lenses and the most compact. Also, this lens is tiny and as I shot from my seat (with no flash), my shooting was unobtrusive. Great seats! (1) Not Normal-enough lens: The normally normal 50mm gave me an effective 75mm on the D70, and being so close to the stage, I could not capture all the dancers, particularly if they were at the front of the stage (see pic 3 for eg.). Perhaps a more normal effective lens (35,f/2) would have been better? Or sit a couple rows further back. (2) White Balance: White balance was on Auto 😦 With the strong incandescent lamps directed at the dancers, I should have switched appropriately! (3) Higher color saturation When upgrading the D70 firmware, I changed the picture setting to “Vivid,” yielding a more color saturated picture, comparable to the Reala or Velvia film shots. This has yielded spectacular portraits during our recent travels. But here, coupled with the incorrect white balance, resulted in the intense yellows, particularly in the first pic. (4) Higher proportion of pics had shake: To shoot the pics, I had to sit-up in the seat, which made me very conscious that I was obstructing the view of the folks behind me. Thus I was not completely relaxed while taking the pics and prolly the reason for camera shake! Oh Well. There will be other days. Any suggestions/tips for photographing such performances? 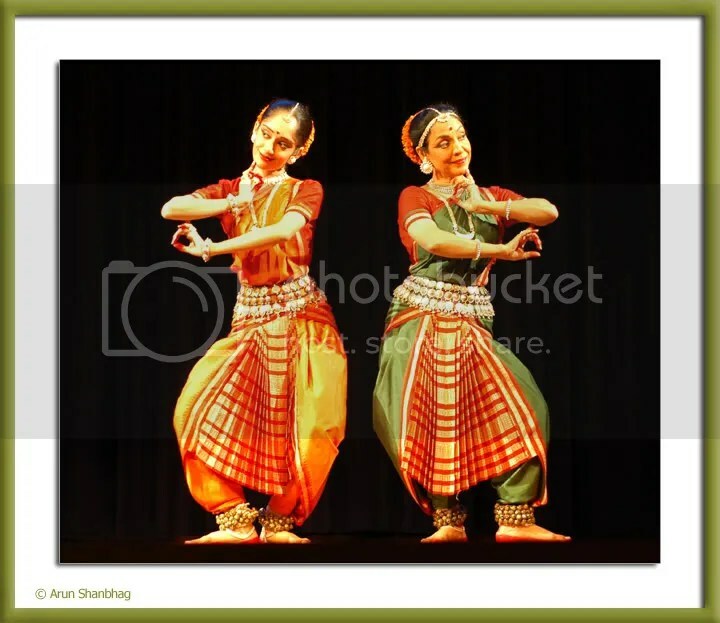 Arun, that was very interesting to hear about another odissi performance. What about their performance? I don’t find any posts. Please add one when you find time. O well, there will be other performances. Interesting entry. I got a chance to enjoy her presentation for an hour at Coimbatore yesterday. Yes, they gave a beautiful presentation; glad you enjoyed! 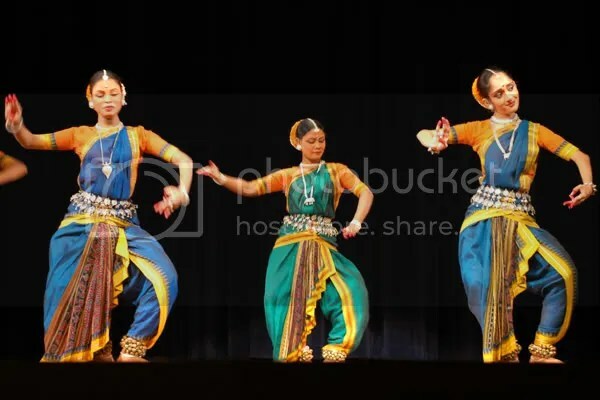 and more interestingly, last evening I was attending another Odissi dance recital by Leena and Leesa Mohanty! More fun! And thank you for linking to the post and newspaper clippings.